Stephen Lapinsky is Director of the Intensive Care Unit at Mount Sinai Hospital, Toronto and Professor of Medicine at the University of Toronto. He graduated from the University of the Witwatersrand, Johannesburg, and trained in Pulmonary and Critical Care Medicine. His clinical practice includes general Critical Care Medicine and ambulatory Respirology. 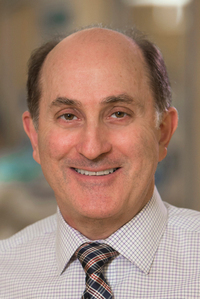 He has a clinical and research interest in critical illness and respiratory disease in the pregnant patient which has resulted in nomination to the Editorial Board of the journal Obstetric Medicine, and he sits on the steering committee of the North American Society of Obstetric Medicine and the executive of the Women’s Health Network of the ACCP. Other clinical and research interests include mechanical ventilation, continuous renal replacement therapy and mobile computing in medicine. He has authored over 100 peer-reviewed articles and 40 book chapters on these topics.